If you’ve ever tried finding parking at the racks by Kerr Hall, chances are you’ve turned to alternative parking that has put your bike at risk for impoundment. According to the University of California Santa Barbara’s Associated Students press release, the AS B.I.K.E.S. committee recently approved funding for a bike lot between South Hall and Kerr Hall, adjacent to the Arbor. This project will be adding 350 spaces to the existing 193 spots, which have not been adequate for the high parking demands. B.I.K.E.S., which is covered through student lock-in fees, allocated $50,000 to the project. On April 27, the committee approved for an additional $59,000 to fund the construction of the new location in the grass area adjacent to South Hall and across Kerr Hall. The Kerr Hall Bike Lot Improvement Project is set to begin this summer and completed by the beginning of Fall Quarter 2012. Emily Nord, AS B.I.K.E.S. program coordinator and fourth-year political science major explained that it was a priority for the committee to implement additional parking for bikers. Bikers can also expect for the designated area to have an average of 12 spaces per rack. Dennis Whelan, advisor to the committee and senior campus planner and associate campus architect, is responsible for the planning of the bicycle system at UCSB. He described the congested area to be very dense and in high demand for additional spaces that will compliment the renovation and expansion of the library. “The library addition on the north end will have an entry and reading room, so the anticipation is that this bike lot will receive even more users,” said Whelan. The additional 350 spaces will be great for those who consistently look for parking in this area, and have to depend on a tree to hold up their bikes or even the streets for parking. Jaleesa Black, a second-year sociology major, shared her excitement about the additional parking by Kerr and South Hall. 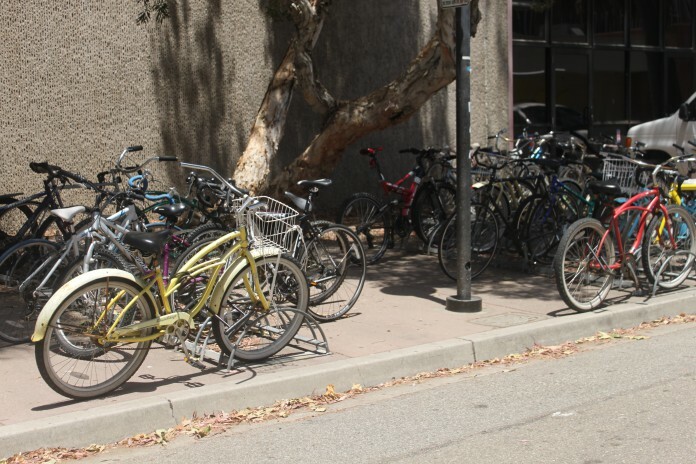 The issue of bike parking can be a much more of a demand than vehicle parking at UCSB. B.I.K.E.S. have a list of priority projects that they are working towards completing in the near future.